While Korean students have their bunshik joints for their after-school fix, I think an equivalent for American students is a good pizza joint. It's hard to find anyone who doesn't like a good pie and I have fond memories of the popular pizza-by-the-slice joints around my high school to hang out after school. 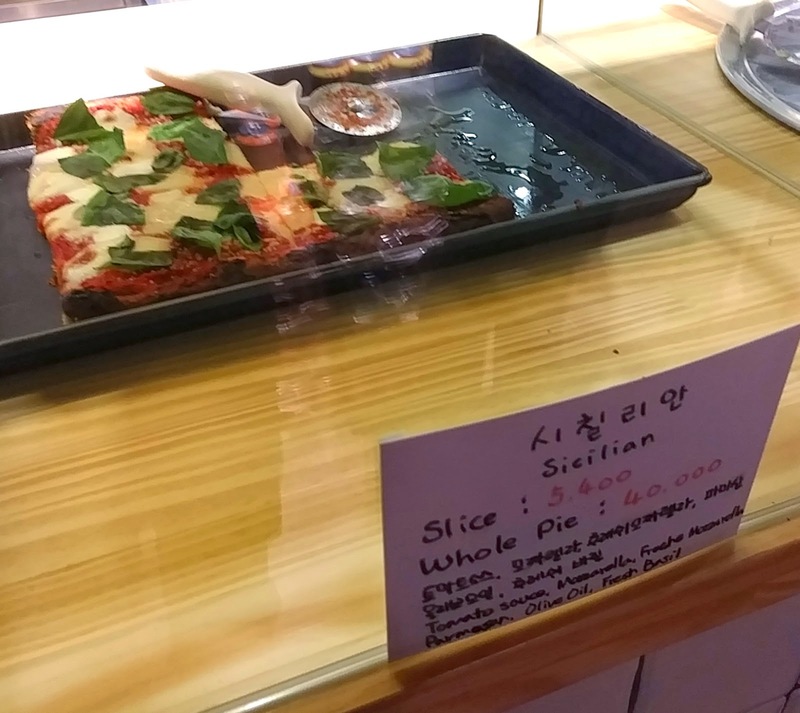 Unfortunately spots that sell pizza by the slice aren't common in Korea nor is it easy to find a decent one. Sure, you can pick up one of the cheap Korean pizzas from the many local chains in most neighborhoods but they're sorely lacking in both flavor and fulfillment that makes it a rarity I ever eat from there. I heard about Maddux Pizza not too long after it opened which won a steady stream of praise for the taste, size, and price of their pizzas which made me keen on trying. After an initial visit, I was impressed enough to make a return visit and yet another.... 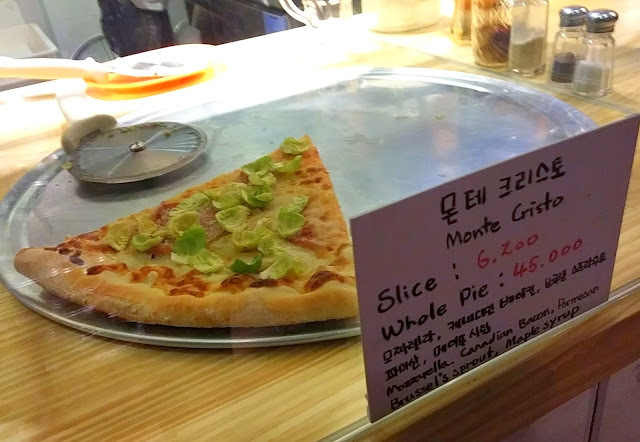 In fact, it's become my favorite pizza by the slice joint in Seoul. 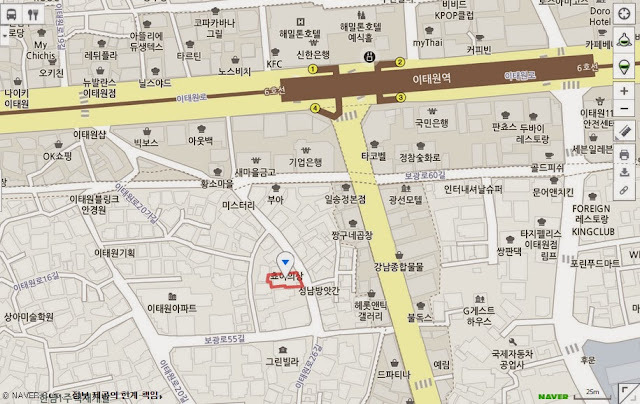 Maddux Pizza is located in the street just parallel to the Bogwangro, that main street that runs down across from the Hamilton in Itaewon. Quite a few number of new joints have been popping up in that area including Maddux. The overall place has a laid back, pub-like style that's not too upscale nor too pizza parlor-like. Brick walls, chandeliers, wooden tables, and all makes it flexible enough to be a casual date night place or a place to grab a slice with some friends. There's no crazy toppings on the pies here and you have but six options here: cheese, pepperoni, Sicilian, Margherita, Monte Cristo, and Spinach & Artichoke. For those options, prices for slices are 4,200; 4,700; 5,400; 6,700; 6,200; and 6,700. Whole pies run from 30,000 to 49,000. The pies come pre-cooked and on display. All one has to do is make an order for however many slices, pay, and they'll go ahead and cook it back up in the oven so it's served hot at your table. Initially the first two times I went, back when it hadn't been long since the place opened, there was a bit of details that needed to be ironed out. Some of the slices spent an extra minute in the oven than needed or orders were mixed up, etc, but nothing big. Thankfully the kinks have worked out since and I haven't had issues in any of the last few times I went. The slices are pretty hefty and big and, depending how hungry I am, two or three slices fills me up pretty well. The slices are big enough that you can easily cut them in half to share and split among friends which is what I've done each time I visited. Tabasco, red chili flakes, and whatnot are also available for sprinkling on. I do much rather enjoy the tang of a good pizza sauce which is why I did prefer the Margherita, Pepperoni, Sicilian, and Cheese over the Monte Cristo. 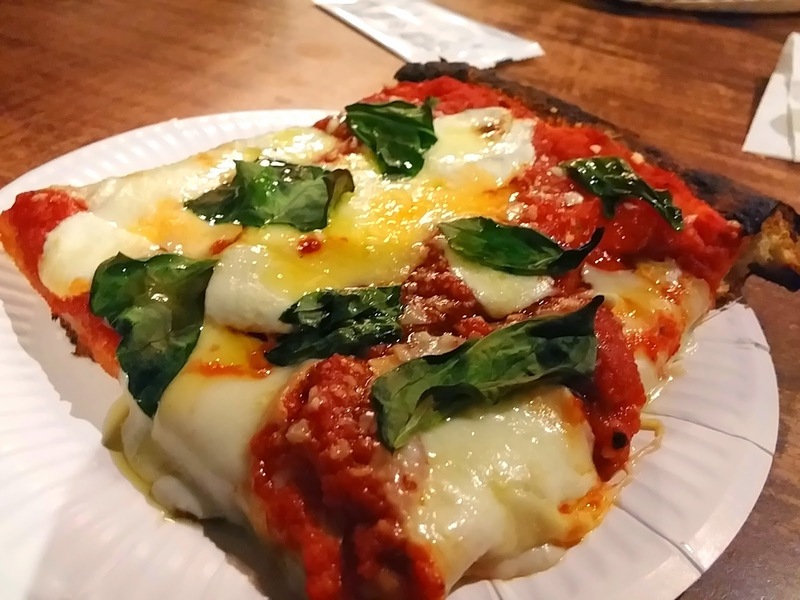 The Margherita is especially a good choice for those who enjoy the simplicity of a good humble pizza slice with its perfect cheese to sauce ratio and little bits of homegrown basil leaves and sprinkling of Parmesan on top. I always say that whether it''s a burger or pizza joint, a true test is to see how well their most basic options fare in taste and quality and Maddux definitely shows it knows what it's doing from their most basic choices. Nice dense bread with just enough chew. I will say though, I have a soft spot for the Spinach & Artichoke. Creamy, cheesy, and with a nice thicker, breadier crust to support it, it's almost like having warm spinach and artichoke dip in a bread bowl. No doubt a calorie bomb but that's where all that good taste comes from. It does seem though, that for the local Koreans who have tried this, the reaction tends to be mixed as some seem to find it too rich or messy to eat. But all others I know who have spent life abroad and knows fully well the irresistible charm of a warm, gooey, spinach and artichoke dip at a party- and especially fresh from the oven- will find this slice an indulgence that perhaps you don't need to feel so guilty over as I have a feeling the Spinach & Artichoke pizza here has less sodium and fat than the dips from home. Seriously. Look at that gooey-ness all hiding under that browned top? Comfort pie at it's finest. With thought behind its food and brand, Maddux makes a statement with its pies that "basic" doesn't always mean it's a bad thing. There's just enough options to placate just about everyone's tastes without falling in taste or breaking your wallet. The casual yet minimally stylish interior makes it flexible for date night or friends night. Walk out exit 4 of Itaewon Station and head straight for about 80 or 90 meters. You'll see Rye Post on the left. Delivery is unavailable but you can call ahead and pick up!